This hot chocolate is anything but ordinary. Made with milk, BAKER'S Chocolate and a touch of cinnamon, this homemade hot chocolate is spiced just right! Cook milk, chocolate and cinnamon in saucepan on medium heat until chocolate is completely melted and mixture just comes to boil, stirring constantly. Discard cinnamon stick. Stir sweetener into hot chocolate. Substitute 1/4 tsp. ground cinnamon for the cinnamon stick. To help keep hot beverages hot, fill mugs with hot water before filling with the hot beverage. Let stand until mugs are warmed. Discard the hot water just before filling with hot beverage of your choice. 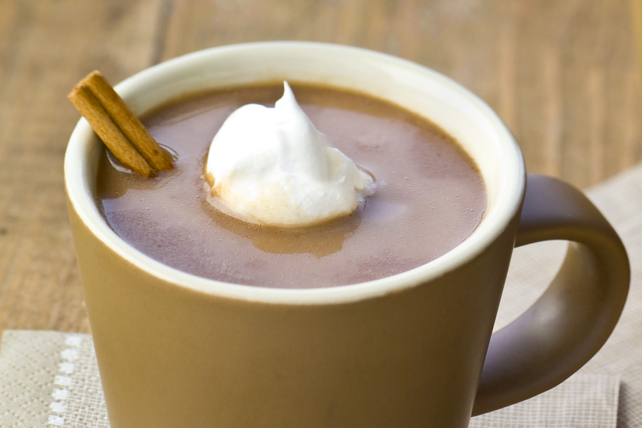 The milk in this Mexican-inspired hot chocolate provides a good source of calcium.